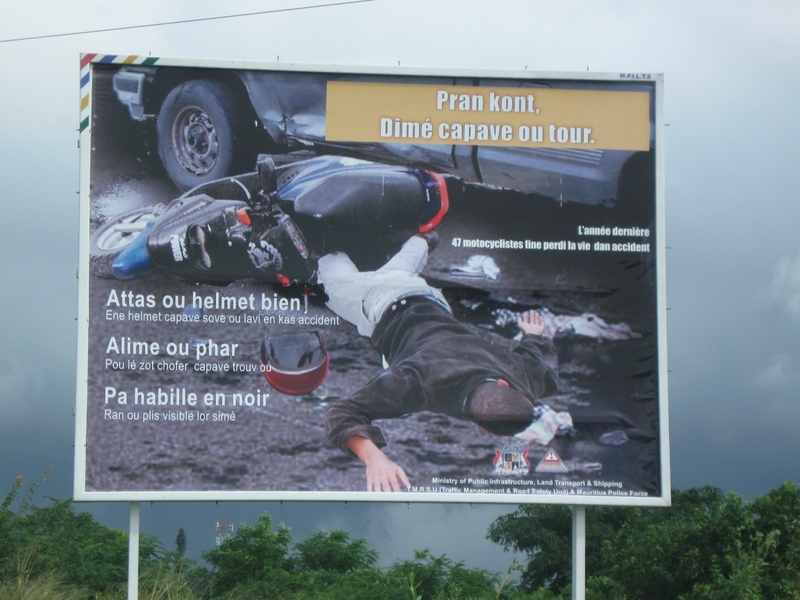 Billboard from MPI and the Mauritius Police Force. Eoula, ki kalité kreol sa ? Couma dire gouvernma bizin al lékol ! I still don’t really understand why written creole wouldn’t be used for an equivalent advertisement in English-speaking former colonies. In Jamaica it would be in English English, even though Jamaicans talk patwa, or patois. When an English-based Creole exists somewhere it is never used in the written form for public advertisement? This is hard to believe. It’s a very convenient way to get a message through. (I’ve seen a lot of instructions and signboards written in Creole on construction sites.) But it must be in proper Creole, not like the one that can be read above. In Papua New Guinea, the official language is the English-based creole called « Tok Pisin » (from « talk Pidgin »), and everything is written in it. But it is not competing with English as is Jamaican Creole. In Mars Kreol is competing with Standard French, and the authors of public announcements are literate in French, so they have trouble writing Kreol properly (they must be writing the texts in French to begin with and just trying to adapt the French text into Kreol, so many « frenchisms » remain). In Papua New Guinea, the official language is the English-based creole called “Tok Pisin” (from “talk Pidgin”), and everything is written in it. Is it because the bulk of the population is literate in this language alone? Do you know what language is used in Papuan schools? (This is a never-ending debate here, since the pupils are supposed to be taught in a language they have never heard before, i.e. English, but at the same time a lot of people don’t want their children to receive a « second grade » education in Creole.) In Seychelles too they have promoted Creole (almost the same as ours) as an official language, but I wonder if this decision hasn’t been discarded now. Well, yes, if you mean the way it is written. But the sentences themselves are fairly creole in the way they are said. For me the worst one, spelling-wise, and even regarding the pronunciation, is the one I have used as a title.